There has been much talk of the Toyota appeal against the penalty handed out to Trulli for overtaking under the yellow flags in Melbourne. It seems that the version of events I assumed in my post yesterday was correct - at least, F1-Live (courtesy of GMMF1) seems to think so. Trulli did indeed go off the circuit after the yellows went out and so it could be said that he was merely taking back his rightful position in overtaking Hamilton. Unfortunately, the rules do not cover rights and wrongs when a car is off circuit during a safety car period. They permit overtaking of a car that is slowing because it has a problem but say nothing about whether this includes off-track excursions. Much depends on the answer to this question, therefore. The stewards are ducking the issue by saying that the case would not be heard by the WMSC as 25-second penalties cannot be appealed against. They have to take that view because the WMSC so famously ruled that way in McLaren's appeal on the Spa penalty last year. And now we can see how the FIA's avoidance of important and result-affecting issues can come back to haunt them. The Trulli incident has pointed out a serious weakness in the safety period regulation; in failing to cover the possibility of cars leaving the circuit and re-joining, it creates a grey area where the teams and drivers have no idea of correct procedure. Hence McLaren's playing safe in allowing Trulli to re-take his position - they have experienced the FIA's rough version of justice often enough to be wary of any possible interpretation of the rules. Some are saying that Toyota could have done the same by querying the situation with the Clerk of the Course, Charlie Whiting. Unfortunately, McLaren has shown that this is pointless, the stewards being quite capable of disregarding whatever Charlie has said before. This is an unacceptable situation for the teams, drivers, fans and the sport. The gap in the regulations has been highlighted and it should be filled as soon as possible by adding off-track excursions to the list of exceptions in which cars can overtake under yellows. It could be argued that this is a matter of safety and so the FIA could make such an amendment immediately, especially as there would be no dissension from the teams - they are always in favor of anything that makes the rules clearer. Thanks to the idiocy of the WMSC's decision that 25-second penalties cannot be reversed, however, this is not going to happen. The safety period rules will not be examined and nothing will be done as usual. Toyota might as well recognize the futility of their appeal and accept the situation as it stands. And the sport will have to continue as before, knowing that there are grey areas in these regulations and others - cooling of the fuel springs to mind as does the definition of leaving the track. It is frustrating that all of these matters could so easily be cleared up with a few alterations to the rules and yet the FIA seems blind to the need. It matters not that I think justice has been done inadvertently this time. The fact is that Trulli made a mistake and had to go off-track; if he paid for it by losing a place, that is only fair. By penalizing the Toyota driver, the stewards have actually agreed with this, apparently lumping off-circuit excursions with the slowing-car rule. But the point is that nothing has been clarified and the next time something similar happens, the stewards could decide entirely differently. It is blatantly obvious that many of the sport's regulations need to be amended and updated but the FIA fail again and again to attend to the matter, preferring to fiddle with unnecessary introductions such as the two-tire per race rule. One is left wondering when the sport will gain a governing body that cares first for justice and racing, rather than how to jazz up "the show". In the Japan '07 race Massa spun while they were behind the safety car, took back his place and then got a drive-through for passing under yellow (http://www.autosport.com/news/report.php/id/62862), wouldn't that be the same as Trulli yesterday? “One is left wondering when the sport will gain a governing body that cares first for justice and racing, rather than how to jazz up "the show". The puppeteer (CVC) and their little puppet (Bernie) are in the entertainment business - and unfortunately, they are also in an F1 power position. To regain a genuine racing venue where justice prevails, we must first see their collective rear ends disappear over the horizon - with the FIA in tow. Trulli? I can see it either way. Vettel & Kubica? I saw a couple of young lions battling it out, with no penalty indicated - after all, didn’t they impose their own? Magnus: Very interesting - I had forgotten that. It would show some consistency on the part of the stewards in regarding spins or off-track excursions as exemptions similar to the case of slowing cars. Mind you, if I were a driver, I wouldn't want to rely on precedent for passing a car that had gone off the circuit - I'd much prefer for it be written into the rules. David: Yup, I can't really seeing things improving until the current incumbents disappear. So often it comes down to that, doesn't it? Good point about Vettel and Kubica having already dealt out punishment to each other, too. I notice you mention the two tyres per race rule. Bridgestone supplied a tyre, the soft one, which may have been good for a hot lap but was clearly not capable of sustaining its performance for one third of the race; bad rule, bad tyre. I wonder whether the FIA has taken the manufacturer to task over this. If you believe Vettel, and I do, that tyre robbed him of a certain 2nd. place. Far from the FIA intervening over the soft tyre nonsense, Leslie, they actually caused it. Over the off season they decided that there needed to be a greater difference between the two compounds at each race and instructed Bridgestone accordingly. Bridgestone achieved the disparity by bringing the medium and super soft (omitting the soft) compounds to Melbourne. It is no wonder the softer option was unusable beyond a few laps. The soft tires were silly, but I must confess that they made me nostalgic for the non-refuelling days when drivers were often in rather different tyres strategies. As for the Trulli/Hamilton situation, I think the more important thing would be to Whitting and Donnelly to do a quick meeting with the drivers Thursday and make clear that what happened to Trulli would be the standard for the whole season. It's a pretty simple move, then off course they would not bother. It seems to me that if you go off the track under the yellow flag you are definitely not driving cautiously in which case you deserve to lose the place! I suppose that would be to logical an explanation for troubled brothers. It makes sense that the "slows with an obvious problem" rule was used; Trulli was slowed and the obvious problem was that he wasn't on the track. I'm not sure why McLaren instructed Hamilton to give way again. I think the reason the regulations are not more specific was to differentiate between drivers going off without slowing down and those who slow down (whatever the cause). If a driver goes off and doesn't slow down, there is no method of overtaking without increasing speed and therefore the rules discourage such an attempt. The problems were two-fold; Jarno's incident occurred too close to the end of the race for the usual drive-through penalty to be used and also everyone finished behind the Safety Car. So everyone on the same lap as Jarno was within the magic 25 seconds and the stewards' only alternative would have been to issue a 10-place grid penalty for next race (also excessive). So it was a no-win situation. The tyre rule is indeed the height of stupidity, particularly when measured against the FIA's "safety" stance. In theory, by separating the two tyre types used by one compound, the tyre which is actually prime for that circuit is not being used. Don't know how else to put it, but it's blatantly obvious that this is a bad rule. I agree with the stewards decision, but not the implementation and lack of recourse, as you said Clive. Trulli left the circuit, which to me constitutes a slowing car, but why can't it be written in: "any car that leaves the circuit during a safety car period is deemed to be a slowing car and may not resume it's position upon re-entry to the circuit" or something like that. It's not exactly rocket science. Every mention of the Trulli incident brings to mind an IRL race I watched last season. Helioe Castroneves was leading while Justin Wilson was trying to pass him. Castroneves repeatedly blocked him. The race director got on the radio to Castroneves's team and told them to tell their driver to move over and let Wilson past. This was late in the race and handed victory to Wilson. Seems to me if the IRL can do that under a green the most tecnological advanced championship in the world should be able to shuffle the queue behind the pace car into the correct order. It strikes me that if a driver loses control of his car to the point that it leaves the circuit in the dry under a yellow then he should be disqualified. Veteran F1 driver Jarno Trulli is dismissive of Hamilton's achievements, telling the Herald his rival "was lucky to join … the top team", and he was keen to "see how he goes this year", alluding to McLaren's uninspiring pre-season performances. Hamilton doesn't bristle at the criticism but instead smiles and says: "We'll see what happens." Filipe: That's something to look forward to since re-fueling will be banned next year. If nothing else, that will mean that the tyres will have to last more than a few laps! As regards Donnelly and Whiting explaining to the drivers about the rules, unfortunately they don't have that authority. The matter would have to go to the WMSC before the drivers could be given a clear instruction. It has happened in the past that Whiting has told the drivers one thing before the race but the stewards have decided otherwise when presented with a relevant case. Logic and the FIA? Isn't that an oxymoron? Nick: Oops, sorry - that last was to you, Nick. Alianora: Unfortunately, it is a matter of opinion as to whether a driver slows down or not after leaving the track. 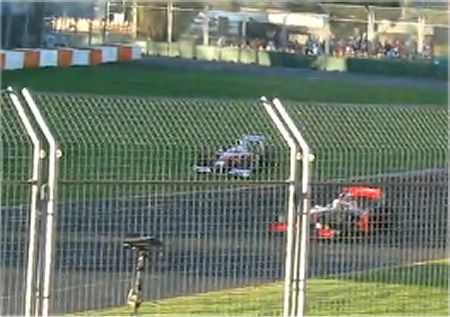 I have seen several comments on the Trulli incident that maintain that he actually, gained speed off the track, never mind maintaining it (I know, it's ridiculous considering the surface was grass - but it illustrates how subjective the issue is). I think the rule should be clarified by specific mention of leaving the track, regardless of acceleration or deceleration. At the very least, the FIA should make it clear that the situation is regarded as the same as a car slowing down. Toby: I like your addition to the rules. Maybe you can get together with Alianora in rewriting the whole book! I agree that giving the stewards more power is undoubtedly a bad thing even now that they need to attend 5 races to qualify. I wass simply making the point that F1 which sees itself as above all others is unable to sort a simple problem when everyone is running round at half speed that the much derided IRL can deal with at racing speed. One question I would like to raise is what exactly was the point of pulling the safety car in on the last lap? No-one can overtake until the finish line so in effect the safety car is still there. It just doesn't appear in the photos. Nothing good canresult from pulling the safety car in but a driver could brake causing another to illegally gain a position. I can only imagine that the idea behind the safety car coming in just before the finish line is cosmetic. It avoids the ignominious photographs of the winner crossing the line just behind a production car, not to mention the slightly ridiculous prospect of the winner circulating on his victory lap, waving to the crowds - with the safety car just ahead and getting in the way. On this occasion, I think it may have been the better option to pull the safety car in. It's been suggested the Hamilton pass was legal as Trulli was off ........ we could tip a couple pints discussing that but lets presume Hamilton did earn 3rd place ....... but then "slowed and pulled over" and GAVE THE PLACE BACK, doesn't that count also? Trulli off or Hamilton slowing and pulling over ...... what's the difference, each driver was forced into an involuntary pass. WHAT COULD TRULLI HAVE DONE? For all the bibble-babble "we know it alls" have been opinionating, Hamilton was told to give the place back and he did. He admits he moved himself back to 4th. What's this all about? To my knowledge there's been no dispute between McLaren and Toyota, no harsh 'language' between drivers, I give Hamilton a gold star for sportsmanlike conduct. It's the FIA that seems to have made an issue of this, but for what reason? I haven't yet heard a REASONABLE explanation. The bottom line ...... drivers get a micro-second to make a decision, the FIA get all day to judge them wrong. For once I agree with Number 38, if Hamilton slowed and waved Trulli through, wouldn't Trulli assume Hamilton had a problem and continue on by? What else could he do pull over and park behind Hammy? I have not heard anyone suggest that Trulli simply passed to regain his spot. The penalty should be reversed on grounds that no violation was commited. Stupid. The longer I live the lower my opinion of humans in general and humans in a position of power in particular, is lowered. I agree with you to a point, however I think this whole matter has been caused by last seasons ridiculous decisions. Mclaren are petrified of doing anything that can possibly be punished by the stewards, as hamilton passed trulli under yellow flag conditions (albeit while he was off track) I can understand why they would allow trulli back in front and then appeal after the race. However it would be nice if there was a way to put Trulli back into his rightful place of 4th rather than a 25 second penalty! Clive, if Trulli didn't slow down by going off-circuit, then Hamilton would have to have sped up when overtaking him - something that is not permitted under the Safety Car due to the fact that it includes yellow flags all the way round the circuit. I have to assume from the fact that the stewards chose not to penalise Hamilton for increasing his speed when going past the yellow flags that they implicitly accept that Trulli had slowed down when he went off. Once they've done that, then logically they must also accept that the pass was in compliance with the regulations - at least by the letter. at safety car speeds because Trulli took a long detour round the local shopping centre. Number 38: The point is worth arguing since so many are doing exactly that. I write about it purely in an attempt to bring my opinion to the debate. There is a difference between a driver losing a place through a mistake and another who is told to let the driver behind through. In this case, the second instance would never have happened had not Trulli already thrown away his position by going off the circuit. And it would have been an optimistic man who took the "what else could I do?" line with the stewards; in the past (the Massa/Bourdais incident last year, for instance) they have ignored such arguments. Hamilton let Trulli past because he was told to do so by the team, who were concerned about a possible penalty from the stewards, understandably so in view of the harsh decisions against them in the past. To McLaren's and my surprise, the stewards must have taken the view that Trulli had been passed legitimately and his pass on Hamilton then becomes a pass under the yellows. I disagree with you that this was an incident that did not need to be looked at by the stewards. Passing under the yellows took place and that is against the rules - the stewards had to decide whether everything had been done correctly and no penalty required. We all know their decision and I think it was the correct one. Lonny: I disagree, as outlined in my reply to Number 38. Everything hinges on how you take Hamilton's pass during Trulli's excursion to the grass. If you decide that it was legal, then the positions should remain the same; if not, the stewards were correct in penalizing Trulli. And it seems to me that a car off the circuit clearly has a problem and can be passed legitimately therefore. Agree completely with your sentiments regarding clarification of the rules. Alianora: I think Peter has answered your point regarding the Trulli excursion quite adequately. Take a look at the video on Keith's site and marvel at just how far off the circuit Trulli went! I must be on to something, I'm winning a few converts. Maybe if I can explain it in LESS WORDS! Trulli lost his position by whatever means. Hamilton is now in third. Hamilton SLOWS and PULLS OVER ..... as if disabled. Trulli is then FORCED to pass. It was an INVOLUNTARY pass. Hamilton later explains his managers orders and one would think that would exonerate Trulli. Trulli didn't TAKE the position back, it was GIVEN back for whatever reason, it was GIVEN back! The drivers acted correctly, the FIA have made an issue of this. A further issue, drivers are expected to make the correct decision in a microsecond, why couldn't the stewards have made their decision before the podium ceremonies? Still can't agree, Number 38. Your argument hinges on the statement that Trulli was forced to pass - he wasn't and no one can force anyone else to pass unless their momentum is such that they cannot decelerate sufficiently in time (as was the case in Hamilton's pass of the Toyota). If Hamilton was able to slow to let the Toyota by, Trulli could have slowed too. Trulli's assumption (if it existed) that Hamilton had car trouble holds no water since he should then have given the place back when he saw that Hamilton had no difficulty in following him thereafter. My opinion is that this is an afterthought by Trulli to attempt to evade the penalty from the stewards. At the time of the event, I reckon he saw things exactly as Hamilton saw them - that the McLaren driver had passed him under the yellows and was now giving the place back. What the drivers thought is a bit irrelevant anyway. The stewards have two passes under the yellow to adjudicate. From their decision, it is clear that they took Trulli's off track excursion to be a case dealt with under the "car in trouble" exemption, whereas they did not believe Trulli's similar excuse for his overtaking of Hamilton. That is how they saw it and, for once, I think they are correct in their judgement. But agree with you when it comes to the brief moment in which a driver has to decide on one course of action or another. The problem arises because the rules are unclear and their application in the past variable. The rules should be written in such a way that there can be no doubt as to their meaning. If they prove not to cover all eventualities, additions should be added that keep the meaning clear. That is the only way to give the drivers a solid basis upon which to base their decisions in the heat of the race. gimme a break, Toyota needs you on their pit wall! Have another drink, I'll buy! Hamilton slowed and Trulli could also have slowed and they could have exchanged notes as they pass each each other 4 or 5 times. Are you in fantasyland? Trulli was FORCED to pass and Hamilton's statement SHOULD have been considered by the lame-brained stewards. These poor blokes are out there on their own, McLaren learned to FEAR the IRRATIONAL decisions of the FIA and now also has Toyota. Has anyone seen the actually FIA/stewards statement? Quite right about the teams learning to fear the irrational decisions of the stewards, however. My previous post stated "if Trulli didn't slow down by going off-circuit, then Hamilton would have to have sped up when overtaking him" because it was in response to Clive saying that it was a matter of opinion whether Jarno slowed down when leaving the track. If the video demonstrates that Hamilton did not speed up, then the excursion must have slowed Jarno down and the original overtaking move was therefore legitimate under the regulations. Everything would have been fine if Hamilton hadn't let Trulli by again. But if Jarno thought Hamilton was slowing down with a problem (and he did; the problem was lack of understanding of the regulations or lack of faith that the stewards would follow said regulations), then he would have had every reason to overtake. The regulations do not allow the position to be re-taken if the problem then remedies itself because such remedies are not included in the exemptions to the "no passing" regulation (unless the driver is instructed by the FIA), which would explain why Trulli didn't give the place back. So everything was with the regulations (if rather confusing) until the FIA stepped in and confused the situation to the point where every decision it makes on the matter has to be wrong. In answer to your second last paragraph, Alianora: Except that, after noting that Hamilton did not, in fact, have a problem, Trulli could have slowed down to let Hamilton through again - and that would have been legal too. And yes, I know - it becomes ridiculous with cars politely inviting each other to pass in turn. But that is the mess that the unclear regulations and inconsistent decision making from the stewards have brought about. Perhaps foolishly, correcting a previous erroneous overtaking move is not among them. Nobody is suggesting that the Safety Car gave permission, that there was a start or pit lane involved or that it was the end of the Safety Car period. So the lack of an obvious problem on Trulli's car meant that Hamilton could not overtake. The end of Hamilton's problem does not signify that the problem wasn't there - even if the "problem" was related to fear of the FIA rather than anything wrong with the car or driver as such. Even if it did, the regulations do not allow the drivers to take justice into their own hands as they can, for example, under unwritten conventions of chicane-cutting (though the unwritten nature makes even that unreliable).